I couldn’t watch the eviction of the travellers from Dale Farm. I found it too distressing seeing people being forcibly expelled from their homes. However, it had been pointed out to me on a number of occasions that the point of being a traveller is you keep moving on! It has got me thinking, could a similar criticism be made of us in the church? The last thing Jesus said before he ascended into heaven was, “you will be my witnesses in Jerusalem, and in all Judea and Samaria, and to the ends of the earth.” (Acts 1:8) Jesus was a traveller and he created a travelling community that were sent out to spread the good news of His kingdom come to the whole of creation. But maybe like the residents of Dale Farm we have forgotten who we are and that our very identity is as those who are sent out. So I have a plan. You have probably heard of ‘back to church Sunday’, well I want to launch ‘get out of church Sunday’! This would involve all those who spend their Sunday mornings worshipping a ‘God who loved the world so much that he gave his one and only Son’ getting out of their church buildings and finding out what normal people do on a Sunday morning. The purpose is not that they have a day off from delivering a sermon, setting up the PA or looking after the children in the crèche, but they look for opportunities to build relationships with not yet Christians in their community and see where a kingdom agenda might bring benefits to everyone in the locality. What about taking a stall at a car boot sale where really useful things could be given away. How about providing hot drinks to parents cheering their children on at the touchline in the park when it’s freezing cold? Supplying a free delivery service from the garden centre or making available a working party to lend additional muscle at the allotments? The possibilities are endless and it will be inspiring to see how creative the Body of Christ can get! I am currently really enjoying teaching a meditation course at the YMCA on a Sunday morning. It has been brilliant creating an environment where course participants can really share how they’re feeling and being able to make suggestions that might help them overcome some of the issues that they are struggling with. This week we introduced the idea of a good guide who wants to direct them into the way of love and peace. I am really praying that God will begin to reveal himself to them as they begin to listen for His voice in their times of meditation. For more great cartoons like the one above, check out http://asbojesus.wordpress.com/. People say they don’t believe there is anything after they die. Is that the hell I just described? Is it the absence of God and life without even the potential for newness and goodness? Despite the occasional descent into this pit, a world without God is, in reality, impossible to imagine, even for the most ardent atheist. The manifestation of His glory and holiness are everywhere! If “every good gift is from Him” then can we really envision a world without love, beauty, kindness, colour, light and the desire to express the best of who we are through what we conceive and create? I had a really lovely e-mail a week or so ago and I hope the person who sent it won’t mind me quoting it. It was from someone who used to be into tarot. She says of being a volunteer on my outreach team, “Freshers Fayre went nothing like I imagined it! But it was incredible I am looking forward to seeing what else God is going to do. Thank you for showing me the Jesus Cards. I am very interested in getting trained…Thank you for showing me that the past I had is very redeemable! I am so excited for the future.” I believe that God can take any fear, failure or deliberate act of disobedience and turn it inside out and upside down in order to heal us and work through us to reveal His perfect plan and purpose. Does that include my depression? My head says yes, but I would have to admit my heart is not sure! Yet, this “thorn in my flesh” keeps me humble and dependent on His strength and guidance. It gives me an insight into the pain of others and helps keep my heart soft. If it can also motivate me to share the hope of salvation so that oblivion and nothingness might not be the final word in the lives of those who do not yet know Christ, is it really such a curse? I guess that in itself is an example of the redemption possible with God. “He works all together for good for those that love Him.” But I don’t believe that God wants me to stay depressed either. Someone once said you will only be able to help people attain the level of freedom that you yourself have received. I want total freedom in Christ for those I am in relationship with and for myself! If God can turn around the betrayal, abuse, torture and murder of his beloved only Son, He can help me become whole and bring inspiration and strength to others through the testimony of my healing! In the meantime, as I do the hard work of confronting what causes the spiral downward, I hang on to these words, “O Lord, you have searched me and you know me. You know when I sit and when I rise; you perceive my thoughts from afar. You are familiar with all my ways. Before a word is on my tongue you know it completely, O Lord. Where can I go from your spirit? Where can I flee your presence? If I go up to the heavens, you are there; if I make my bed in the depths, you are there. If I rise on the wings of the dawn, if I settle on the far side of the sea, even there your hand will guide me, your right hand will hold me fast” (from Psalm 139). While I might not feel His presence, the truth is He is always there, He always was and He always will be. 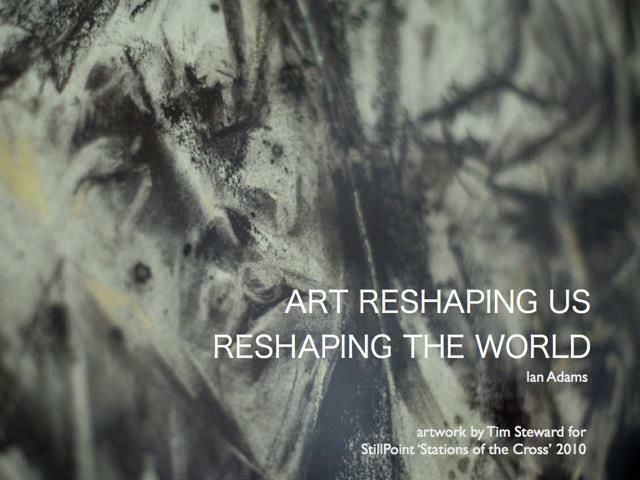 Saturday 15th October I am facilitating a day looking at using the arts for mission, although I love Ian Adam’s description so much better ‘Art reshaping us, reshaping the world’. It really does sum up what we are trying to achieve! Jonny Baker is going to be setting the scene in terms of what art for mission means and then we have workshops on using the arts in different environments that are not church. Ian is going to facilitate a workshop on using the arts in third spaces such as cafes, pubs etc. and another session will be on creating arty spaces at fairs and festivals, led by Colin Brice of Eden People, Guildford. Fran Tarling is sharing her experience of setting up a prayer room in a secular environment and Martin Poole, of advent calendar beach hut fame, will be doing a session on art in external spaces. We will be rounding off the day with an opportunity to create our own art which we will then give to God in worship as a symbol of us offering ourselves and our creativity afresh to be used by Him to reveal His love and goodness. What I especially want to emphasise is that while I don’t think any of us would describe ourselves as professionally qualified artists, because we are made in the image of a creator God we feel His pleasure when we express our creativity and individuality whether its through writing, music, photography, textiles, new ideas, sculpture or the visual arts. So many people are put off because they think they are not good enough but actually I think God meets us in the process and it is His partnering with us in the creation that makes the end product something wonderful that expresses a facet of our walk with Him. The difficult bit is stepping out, having a go and not judging the results! I have a fantasy. In my ideal world I would have married a rich banker and would spend the week shopping and meeting friends for lunch. I would go to church, but only for an hour on a Sunday morning and would ensure that it made no difference to the rest of my life! I would have an even temper and nothing would bother or fluster me. I would float through the week on a cloud of calm and contentment and my most pressing concern each day would be which M&S ready meal to choose for tea. No one would look to me to organise anything beyond the occasional social gathering and the three foreign holidays a year! OK I would absolutely hate it, but this week I have felt like I would do anything for a quiet life! Sometimes it feels so draining having to be creative and inspiring all the time. Why can’t I just have good ideas and leave it at that. But oh no, I actually have to think they have legs and might bless other people! I work my socks off to make them happen and take the risk that they could come to nothing or worse still no-one will show up or that those who do, will think what I have put out there is rubbish! Most of the time I feel like I am walking around with my skirt tucked in my knickers revealing the most vulnerable and unattractive part of myself! Am I some sick masochist that I have to keep putting myself through this? Even by writing this, I am doing it again! I am feeling nauseas at just the thought of pushing the publish button on this post! However, I believe in honesty, I believe in trying new things and I believe that by revealing our weaknesses, Christ is glorified. Like the Old Testament prophets, I feel compelled to keep doing and being what God has called me to, despite the discomfort it constantly causes me. Regular readers of this blog are probably sick to death of this book by now, but it is amazing how often God speaks directly into my current situation and most recent preoccupation through ‘Luke for Everyone’ by Tom Wright. My reading yesterday was about the transfiguration. Jesus takes Peter, James and John up a mountain and as He prays, His appearance is transformed and Moses and Elijah come alongside and enter into conversation with Him. The disciples are blown away and Peter, engaging mouth before brain, suggests building tents for each one of these giants of the faith. Then a voice from heaven declares, “This is my son, my chosen one: listen to him.” Jesus is once again left alone. They descend the mountain and what are they immediately confronted with but the voice of another father. In total contrast, though, this father is utterly distraught and in despair. His only son is possessed by a demon. Here is what Tom Wright says by way of commentary: “…the gospel writers … seem to be telling us that they go together: the mountain top experience and the shrieking stubborn demon. Many people prefer to live their lives without either, to be people of the plateau, undramatic and unexciting. God seems to call some to that kind of life. But, for many, dramatic visions and spiritual experiences are balanced by huge demands. The more open we are to God, and to the different dimensions of God’s glory, the more we seem to be open to the pain of the world…These things are never given for their own sake, but so that, as we are equipped by them, God can use us within his needy world” (p. 114). So, given the choice between my fantasy and the reality of being a pioneer, which should I choose? I can only be what God has made me to be. So today I choose life transforming encounters with him, flashes of inspiration, the potential for humiliation, the wrestling with doubt and depression and the joy of relationships which can cope with the reality of these peaks and troughs. Lord, just give me the strength to keep choosing it, one day at a time!